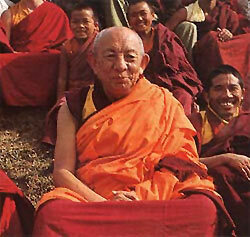 Kyabje Tsenshab Serkong Tugse Rinpoche was born on July 27, 1914, in the area of Loka in southern Tibet. His father was one of the most outstanding masters of the last century, the great Serkong Dorjechang, the incarnation of Marpa the translator, his mother the incarnation of Marpa’s wife Dagmema and Tsenshab Serkong Rinpoche the incarnation of Marpa’s son Darmadodey. 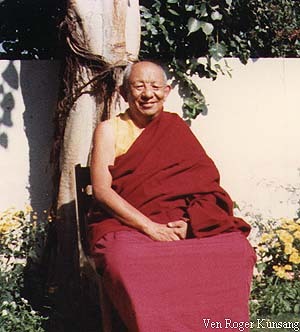 In India, Tsenshab Serkong Rinpoche further served His Holiness in helping establish the Office of Religious and Cultural Affairs. He also served as one of His Holiness’ main advisors, chief performer of his personal religious rituals, his teacher of Buddhist technical knowledge and skills such as mandala construction and his spiritual lieutenant for communicating and carrying out his policies.